Paper speakers are easily customizable, portable and extremely useful for customers of all ages. Disneyland Hong Kong was giving out their customized paper speakers. Read on more to find out about the success of this promo gift! Disneyland Hong Kong is one of the most visited theme parks in Asia. 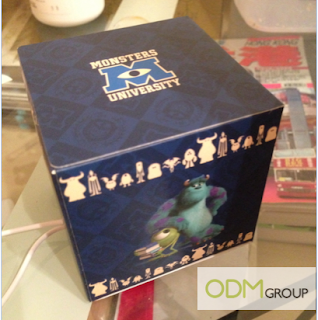 This time, they are collaborating with the popular movie, Monster University to give away their portable speaker with purchase of Disneyland tickets. Customized paper speakers are useful, especially for youths and families. Customized Paper Speakers to Brand Yourself. Paper speakers are extremely flexible to suit your company’s needs. You can consider printing your brand’s name and logo on it and given out to people as part of your marketing efforts. This would increase brand recognition and encourage repeat purchases from your customers; improving customer loyalty. This customized paper speaker would usually be used in crowds. People who use them in parties and gathering would become a tool for direct advertising of your brand to others. This way, more people would know about your brand. · Stand out from your competitors with unique promotional gift! Go Environmentally-Friendly with Customized Paper Speakers. Everyone is talking about going environmentally friendly these days. If you were to jump ahead on this bandwagon by using recycled paper for your product, your brand’s image will increase positively. By using recycled paper in your customized paper speaker, you are playing your part to be responsible in the society, and also encouraging others to be responsible too. You can even imprint environmental awareness message on your customized paper speaker like Earth Day to increase the corporate social responsibility to your brand! What are you waiting for? Contact ODM today for more information!